Welcome to the Shandell’s world! 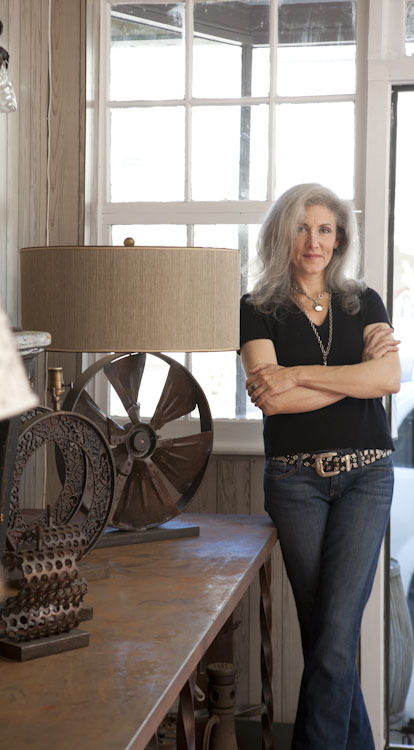 My name is Susan Schneider, and I have been a mad collector of vintage goods in many mediums for the last 20 years. I’ve since amassed quite the collection of wallpaper, old prints, books, and lamps of all types, which I transform into custom lampshades, night lights, unique tissue box covers, delightful matchboxes, and holiday ornaments—in short, all sorts of fanciful things that I’ve designed to make you smile.I stumbled into making lampshades, my Shandell’s specialty, 20 + years ago. At that time I had an antique and decorative-arts store that focused on vintage textiles, and I found myself on a constant search for decent lampshades to go with my fabulous vintage lighting finds. A lampshade-crafting customer, Liz Courtney, convinced me to try my own creative luck. She sold me her barn full of supplies and took off for her Caribbean winter home. In the beginning, my studio space was just an eight-by-ten bedroom, where I crafted in a frenzy. My earliest lampshades, made from collaged vintage wallpapers, were featured in Country Home and Victoria. My collection of vintage lighting had grown through the years. I am lucky to have four friends send me wonderful finds from around the country on a regular basis. I make my own lamps out of antique and unusual findings, even bits of nature. Pairing my lamps with a wonderful shade is like putting icing on a cake—the best part. My styles and vary often: sporting art, horses, dogs, bugs, and nature. Most of all, I just like to create. Come and explore my world of fanciful treasures. All handmade by me in Shandell’s working studio, using parts of my adored collections that I love sharing with you.